Adjustable push-pull angled design uses the sides of the bristle, not the ends, to produce a superior brush finish. 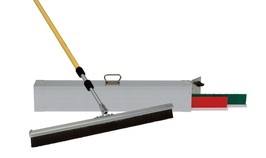 The widest concrete finishing brush on the market available in 4', 6', and 8' widths! Five color coded texturing brushes to choose from all made with #612 nylon resin. Other features include our high density polyethylene block and our aluminum extruded channel, which not only makes this brush durable but allows you to swap out the bristles with any of our other 5 texturing options. 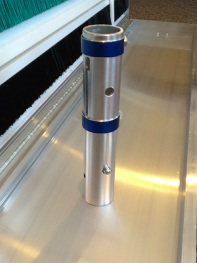 Now you can get the widest concrete finishing brush on the market in a protective and convenient aluminum carry case! This kit comes with 3 brush refills with the textures of your choice as well as our Multi-use Adapter. Available in 4', 6', and 8' widths. 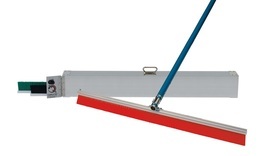 A handleless concrete finishing system (rope brush) that is pulled from side to side with ropes (eliminating excessive handle weight) to give you the most uniform textured finish on the market. Works wonderfully in confined areas where handles are awkward and is able to finish concrete 50%-75% faster with our 4', 6', and 8' wide brushes. Offers different textures with color coded brush refills. 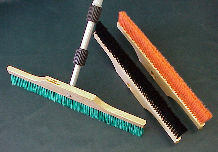 Converts easily from handleless twin brush system to two individual brushes used with our Multi-Use Adapter and handles. This system also converts into a Bull Float with Brush or Fresno with Brush by simply ordering our Adapter Bar Kit (MBBAK or MBFAK). An optional Carry Case is available. This kit comes with our patented Chameleon Trac II System as well as three sets of refills, ropes, a heavy duty carry case, and our Multi-use Adapter which will allow you to use the Chameleon as two single brush units! Available in 4', 6', and 8' widths. The Chameleon Trac II M-Series Power Unit is designed to motorize your existing 6' Chameleon Trac II System. By attaching the Power Unit to your 6' Chameleon Trac II you will enable your brush to provide an even more consistent finish while increasing accuracy, improving long range performance, and decreasing arm strain on larger pours. 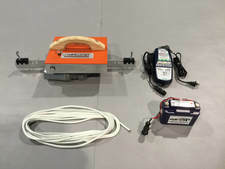 The Power Unit comes with 2-100' tracking ropes, a battery, and a charger. This unit will provide 10,000-12,000 square feet of finishing on a single charge. 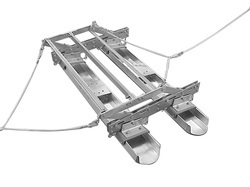 Standard 100' ropes are also included for traditional manual operation. Additional batteries sold separately. The 6' Chameleon Trac II M-Series Power System is a motorized version of our traditional Trac II. This system will provide an even more consistent finish while increasing accuracy, improving long range performance, and decreasing arm strain on larger pours. This system comes with our 6' Trac II in your choice of brush stiffness, the M-Series Power Unit, 2-100' tracking ropes, hardware, a battery, and a charger. This unit will provide 10,000-12,000 square feet of finishing on a single charge. Standard 100' ropes are also included for traditional manual operation. Additional batteries sold separately. 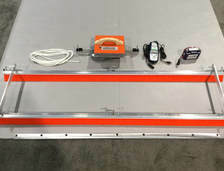 The 6' Chameleon Trac II M-Series Power Kit is a motorized version of our traditional Trac II. This system will provide an even more consistent finish while increasing accuracy, improving long range performance, and decreasing arm strain on larger pours. 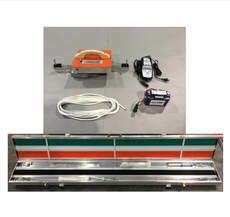 This system comes with our 6' Trac II Kit which includes a brush carry case, three sets of brushes (black soft, orange medium, and green stiff), the M-Series Power Unit, 2-100' tracking ropes, a multi-use adapter, hardware, a battery, and a charger. This unit is capable of finishing 10,000-12,000 square feet on a single charge. Standard 100' ropes are also included for traditional manual operation. Additional batteries sold separately. Our conventional finishing brushes feature the same superior nylon resin bristles as our Chameleon Finishing Brushes and are available in 24" and 36" widths. These brushes are made with a hardwood maple brush block with a recessed area for use with our heavy duty telescopic handles or any bull float handle with a 3/4" acme thread. These brushes are available in four different color coded textures-super soft (white), soft (black), medium (orange), stiff (green). This curb / step brush kit utilizes our Chameleon Interchangeable Brush Refills which give you the versatility of three brushes in one heavy duty carry case! Available in 12" and 18" widths. These telescopic handles feature a heavy duty fiberglass/aluminum construction which makes them both durable and lightweight. Each handle has a 3/4" acme thread for use with our conventional bushes, Chameleon brushes, and our Auto Glide brushes! Available in: 6'-12' Two Section, 6'-18' Three Section, and 8'-24' Three Section. This adapter is designed to be used with our Chameleon finishing brush to allow for an adjustable push-pull angle adjustment. 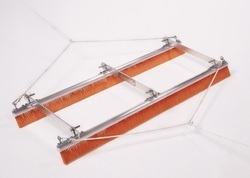 It can also be used for converting your Chameleon Trac II (rope brush) into a single finishing brush. The Multi-use Adapter can be used with standard broom/extension handles as well as bull float handles making it user friendly. 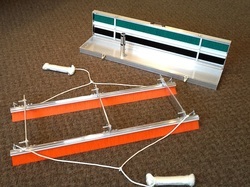 A handleless Bull Float system that is pulled from side to side with ropes. The Bullfrog Trac II gives you an even and consistent floated surface no matter which way you pull it. 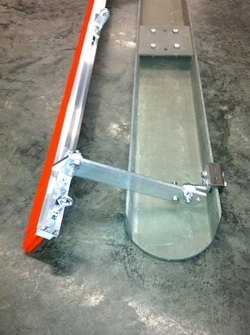 No handle weight to affect the slab and our adjustable mechanism automatically tilts the head as you begin pulling. Especially effective in confined areas where handles are clumsy and awkward. Great for pours of 24 feet or more! Available in 4', 6', and 8' widths (Custom sizes also available). Bullfrog Trac II comes with 1-50' 3/8" nylon rope set and is designed to be used on 6" wide C-channel floats. 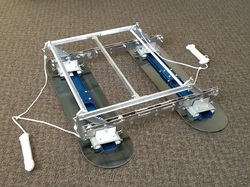 Automatically tilts on both push and pull passes. No need to lift your brush across your pour! Available in five different textures with color coded brush refills. Durable aluminum extruded channel and high density polyethylene block. Available in 2', 3', 4', and 6' widths. This kit comes with The Auto Glide brush system as well as three brush refills (texture of your choice) and a heavy duty aluminum locking carry case to protect your investment. Available in 3', 4', and 6' widths. A fresno and broom finish in one easy step! 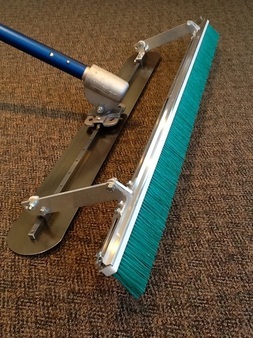 This brush will finish as you bring the fresno back to you and our unique pivoting system means your brush won't dig into the slab but can be locked firm to give that extra downward brush pressure when you need it. 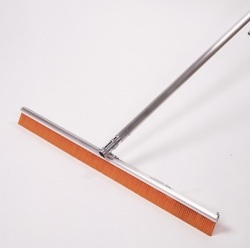 Our special Adapter Bar Kit also allows you to tilt your the brush back and out of the way if you need to work the slab prior to broom finishing. Five color coded texturing brushes to choose from. 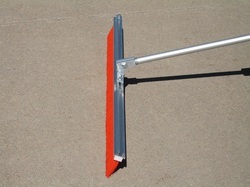 Available sizes include- 36" fresno with 4' brush, 42" fresno with 4' brush, 4' fresno with 4' brush. A Big D Fresno and broom in one! 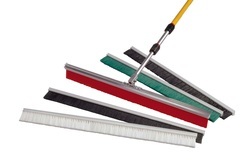 This brush will finish as you bring the fresno back to you and our unique pivoting system means your brush won't dig into the slab but can be locked firm to give that extra downward brush pressure when you need it. Our special Adapter Bar Kit also allows you to tilt your brush back and out of the way if you need to work the slab prior to broom finishing. Five color coded texturing brushes to choose from. Available in 4' fresno with 4' brush, 5' fresno with 6' brush, and 6' fresno with 6' brush. A bull float and a broom finish in one easy step! 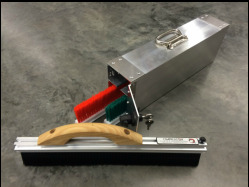 This brush will finish as you bring the bull float back to you and our unique pivoting system means your brush won't dig into the slab but can be locked firm to give that extra downward brush pressure when you need it. 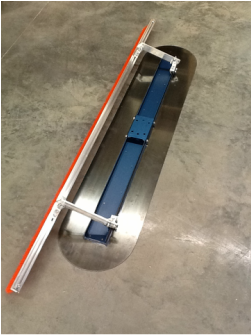 Our special Adapter Bar Kit also allows you to tilt your the brush back and out of the way if you need to work the slab prior to broom finishing. Five color coded texturing brushes to choose from. Available in 4', 6', and 8' widths. The only handleless fresno system on the market! This system gives you a consistent fresno finished surface no matter which way you push it or pull it with no handle restriction. Available in 4', 5', and 6' widths.